Beans vs. Cornbread » More illness to come! First of all, thanks to anybody who checked out “the Illness” teaser. Different people have noticed different things about it and it’s good to see that certain elements have been figured out by a few people. I hope that the stuff in Chapter One will nudge people into looking at the teaser again to see what meant what. This story is STILL writing itself and I’m on auto-pilot. 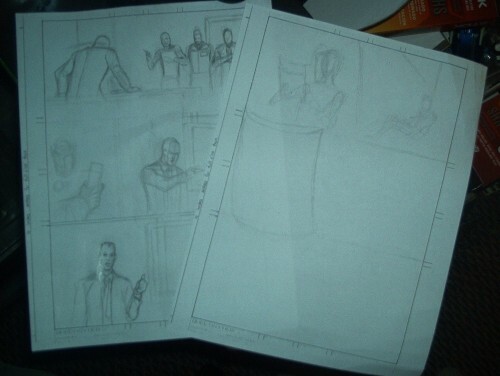 The layouts in that pic over there would’ve been pages one and two if I didn’t change my mind last night and come up with a different page one. I’m drawing that now and MAY have that finished by Sunday. I’m afraid that it’ll only explain a bit of the preview, but will serve as a smoother transition to what happens in those layouts over there. It’s not wacky Nutroll action yet, but it’s going to add some texture to what’s revealed later. I have no idea how much Nutroll stuff I’ll have done by this weekend, but I think I have this Friday off. If so, I’ll have much more time to work some crazy Nutroll magic for you. One idea is semi-spoileriffic to the story, but at least it’ll offset the rather boring page I’m working on that chock-full of snoozariffic story foundation.